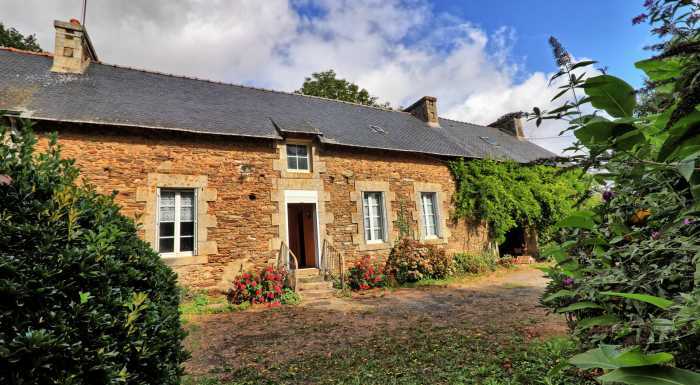 Properties for sale in Brittany, France - AHIB-2-DN-674 Saint Allouestre 56500 Interesting renovation project on 3700m2 - live in whilst doing the work! At the moment the property consists of a large kitchen with fireplace, toilet with was basin, entrance hall and two more rooms, one of which also has a fireplace. In continuation of the house is an open fronted "barn" where you will find a bread oven. Large loft space above the whole property which can be converted for extra space. On the land of just under an acre, is an old haybarn and a well. Although the property is semi-detached, each property has its own entrance lane. A great project for a DIY'er, and it won't take much to make it a liveable in a rudimentary way! Fireplace, Double glazing, Internet, Carport, Well.